Fish is the richest dietary source of essential omega-3 fatty acids. Eicosapentaenoic acid, or EPA, and docosahexaenoic acid, or DHA, are the major omega-3 fatty acids found in fish. Plants can provide only alpha-linolenic acid, or ALA, an omega-3 fatty acid that appears to have fewer health benefits. Adding small ocean fish, such as anchovies, to your diet increases your omega-3 levels and provides a good source of protein, without adding saturated fat. Anchovies have some of the highest levels of omega-3 fatty acids of all fish and seafood. A 3-oz. 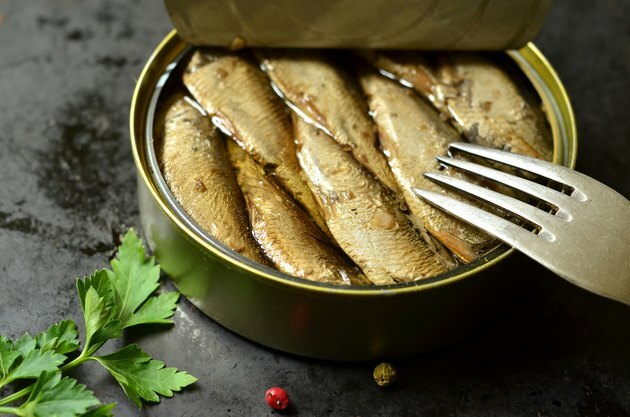 serving of canned anchovies provides 1.4 g of omega-3 fatty acids. Other fish that are high in omega-3 fatty acids include Atlantic salmon or herring, blue fin tuna, sardines, Atlantic mackerel and canned salmon. All of these types provide more than 1 g of omega-3 per 3-oz serving. Omega-3 fatty acids are important during development as they support brain and central nervous system growth. Fatty acids reduce the risk of heart disease by protecting against plaque buildup in the arteries, lowering blood pressure and decreasing rates of heart arrhythmias. They also lower harmful cholesterol levels and triglycerides. The American Heart Association recommends that most adults consume two, 3.5 ounce servings of fish per week. Pregnant women and children should avoid types of fish that are high in mercury and other environmental contaminants. Large, predatory fish that are long-lived accumulate these toxins in their bodies over time. Smaller fish, such as anchovies or sardines, provide plenty of heart-healthy omega-3 fatty acids without the added concerns about mercury. For individuals who do not consume fish regularly, an omega-3 supplement could be beneficial. As with any new supplement, talk to your doctor before you begin taking it. Do not take more than 3 g per day unless under a doctor's supervision. High amounts of omega-3 fatty acids can cause excessive bleeding in some people.